The gateway will provide a doorstep for trading on a variety of exchanges. 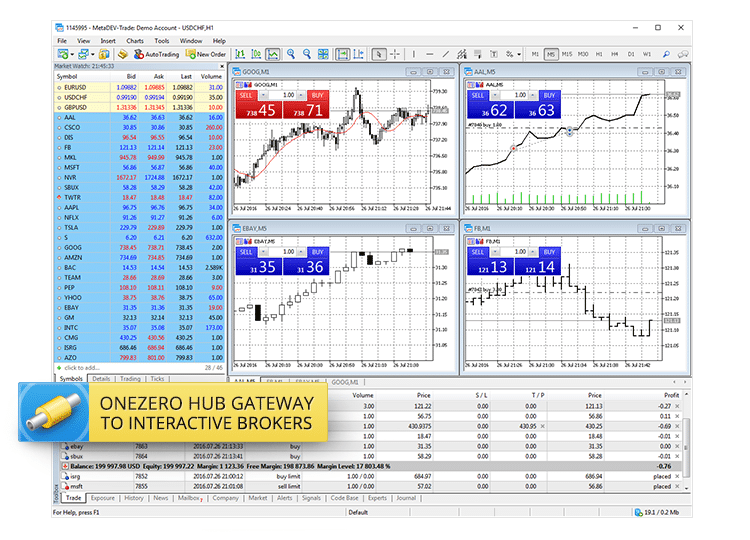 oneZero has just partnered with MetaQuotes Software to deliver a new connectivity gateway allowing companies to integrate with Interactive Brokers (NYSE:IBKR). The solution will be available via the oneZero Hub product, opening access to the top U.S. broker’s massive stocks, futures and exchange traded products portfolio. The gateway will provide a doorstep for trading on a variety of exchanges with the biggest amongst them being the New York Stock Exchange (NYSE), the London Stock Exchange (LSE), the Hong Kong Exchange (HKEX), the Tokyo Stock Exchange (TSE), the National Association of Securities Dealers Automated Quotations (NASDAQ) and others. Foreign exchange trading will not be excluded from the offering, opening the door for Interactive Brokers to a very long list of prospective new clients. Market depth data will be available for all applicable instruments. The Interactive Brokers gateway will grant access to brokerages to advanced features such as automatic corporate actions, like dividend payments. The offering includes all types of securities except for options for the time being. The full list of the offering that is being enabled via the solution is available on the corporate website of Interactive Brokers. The distinction for the brokerages which choose to access the Interactive Brokers gateway is that they will be able to deliver access to multiple exchanges via a single connection. In order for clients to activate the connectivity to Interactive Brokers, an active account with the brokerage is required. “The addition of Interactive Brokers is an excellent complement to the institutional features, such as Depth of Market, available in the MetaTrader 5 Platform,” he elaborated. no reason why they couldn’t do this with mt4 as well. Not all the features would be available, but it could have been done a year ago, couldn’t it? Nevertheless, a step in the right direction. And other futures/stock brokers might follow suit and catapult mt4/5 into mainstream.